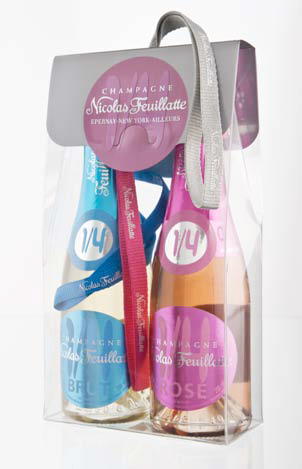 Celebrate the Holidays with Champagne Nicolas Feuillatte! Celebrate the Holidays with Friends, Family, and Champagne Nicolas Feuillatte! for holiday 2010 (and New Year’s day 2011)! True Champagne is is French and Champagne Nicolas Feuillatte may not be the most expensive, but it is one of the most delightful. The holidays are the perfect time to gather with loved ones and celebrate the joys of the year and good fortune of their company. 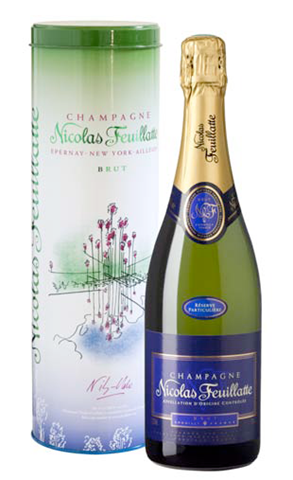 Whether this holiday gathering is over a home cooked meal of seasonal dishes or at a boisterous or intimate party, Champagne Nicolas Feuillatte has an exceptional range to provide the perfect compliment. We immensely enjoyed the Brut NV, which is renowned for its balanced and elegant character and comprised of a blend of meticulously selected crus that include 20% Chardonnay for elegance and finesse, 40% Pinot Noir for roundness and structure and 40% Pinot Meunier for fruit. It is at once austere and flavorful, always a delight. It is an ideal accompaniment for appetizers, throughout the entire meal or for celebratory holiday occasions. Try it with caviar, sushi, smoked salmon, a festive roast, steak, assertive seafood, shellfish and cheese or nuts. Rose Brut, the signature of Nicolas Feuillatte, is an intense, impertinent pleasure! There is simply no other rosé Champagne like this cuvée from Nicolas Feuillatte. Blended from 60% Pinot Noir, 10% Chardonnay and 30% Pinot Meunier this wine evolves the glass with intense aromas and a festival of flavors, including raspberry, strawberry and red currants. Well structured, elegant and smooth it is beautifully balanced. Lovely with fresh goat cheese, salmon, roast pork, poached chicken, venison in a cranberry sauce and fresh fruit. This holiday season Champagne Nicolas Feuillatte offers three holiday packages ideal for celebrating or as gifts: a 750-ml bottle of Champagne Nicolas Feuillatte Brut NV in a beautiful keepsake canister by 2010 Artist of the Year Nils-Udo; a 750-ml bottle of Champagne Nicolas Feuillatte Brut NV, packaged with two elegant Champagne flutes; and a 2-pack of Champagne Nicolas Feuillatte’s One Fo(u)r mini bottles.Keepsake canister by 2010 Artist of the Year Nils-Udo In honor of an 11-year tradition of supporting contemporary art by partnering annually with an avant-garde global artist.